The museum has got several thousand sketches and drawings of the artist from all periods of his creativity. There are even the works which were executed by the few years old future artist. They are records of his first strokes. Missing out the juvenile attemps, consisting mostly in copying art works of masters, the first drawings are kept in expressive convention. Some of them reveal also relations to surrealism. These early projects are the important documentation of artistic explorations. From the beginning, the theme of the works oscillates around the alienated, trapped in the inner drama, evoking painful experience human figure. Its form is geometrized and simplified after 1957. Being interested in geometrical relations, the artist continued traditions of the pre-war avant-garde. In the 60s, the works gradually gain spaciousness through plasticizing modeling and delicate chiaroscuro. The drawings as well as graphics appearing in the years of 1956-1969 which were made by means of the cliché-verre and monotyping technique, are still variations on the theme of the human and animal figure. Initially, they revealed inspirations of the cubism. There preserved also enormous number of sketches from the years of 1957-1962, where there are often presented multi-figure scenes. They were drawn with thin lines by means of a pen and a black or a coloured ink. In the 70s, the spacious drawings are stylistically similar to the simultaneously appearing pictures of the fantastic period. The artist had experimented from the 90s, combining the traditional drawing with the computer graphics by mean of a photocopier. The recent drawing works are usually sketches being used as a preliminary step at painting a picture. 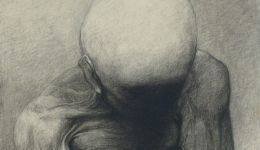 From the beginning to the end, a head, a human and an animal figure, then also a landscape are the main materials of every drawing and graphics composition which was executed and transformed by the artist in different ways. 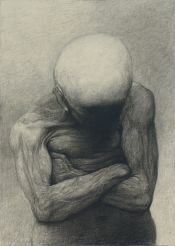 Beksinski stressed that those two themes are inexhaustible source of inspiration and capabilities of various transformations. It is confirmed by almost all of his works made by means of various artistic techniques.